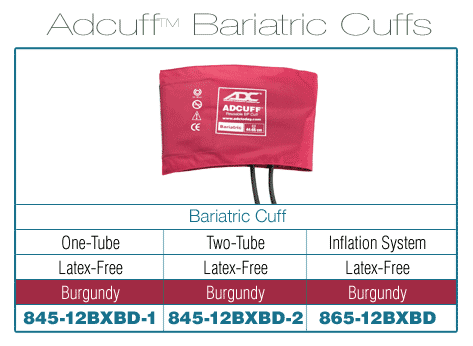 Our Bariatric cuff provides a cost-effective solution to the challenges of measuring blood pressure on severely obese or bariatric patients. In many cases large adult cuffs are too small, while thigh cuffs are too wide to fit on the upper arm on all but the tallest patients. Measurement is further complicated by the conical shape of a bariatric patient’s upper arm, making it virtually impossible to obtain a proper fit. One solution -- measurement on the forearm -- is tricky at best and many practitioners don’t have the training or experience with this technique.